It seems like five minutes ago that Motherwell were in a relegation battle, but an incredible transformation over the last month has given them significant breathing space, writes Craig Goldthorp. 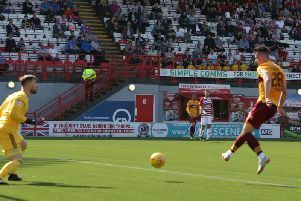 The 1-0 win against at Dens Park on Saturday – thanks to a comprehensive second half penalty despatched by the impressive David Turnbull – puts the ninth placed Steelmen a mammoth 13 points above 10th placed Hamilton Accies in the Scottish Premiership table. Compare that scenario to as recently as 20 minutes into Motherwell’s away game against Hamilton on December 29, when the claret and amber men were 1-0 down against an Accies side they led by only four points in the overall standings. If Accies had held onto that lead given to them by Dougie Imrie, they would have moved to within a solitary point of ’Well in the table. But two stunning Tom Aldred goals won that match 2-1 for Motherwell and they have followed it up with post winter break victories over Hibernian (see page 37) and Dundee. Tenth placed Accies are now a mammoth 13 points behind the Steelmen, while ’Well are also now 14 points clear of Saturday’s opponents Dundee (11th) and 15 ahead of St Mirren (bottom). ’Well now have a realistic prospect of finishing seventh for a second consecutive season, not bad for a team with a budget which is inferior to everyone other than Livingston and St Mirren in the top division. So manager Stephen Robinson’s recent decision to bin a trusted 3-5-2 formation which they used to get to two cup finals last season has worked. Youngsters David Turnbull, Allan Campbell and Jake Hastie – backed by tenacious Spaniard Alex Gorrin – provide an outstanding midfield, with speedy new winger Gboly Ariyibi providing ’Well with the trickery and pace which was often sadly lacking earlier in the season. Boss Robbo said after Saturday’s win: “A third league win in a row, I think a different performance from Wednesday night. “I thought we were very well organised defensively. “We showed real discipline, defended when we needed to defend and I thought we had a couple more chances that we should maybe have made a better decision higher up the pitch or got a shot away earlier. “I’m really pleased with the performance. A tough game against a team fighting for their lives. “They have made a lot of changes, boys are running and scrapping and making things extremely hard so I’m really pleased we stood up to that. Robinson cleaarly still has regrets about his side’s one disappointing result of 2019 so far, the shock 2-1 William Hill Scottish Cup fourth round home defeat against Championship Ross County on January 19. He added: “Our last three performances show what we’re capable of. “Take away the novelty of the cup result, which we were really disappointed with. “But we’re trying to build things, we’re trying to put young players into the team. “We’re trying to change a little bit what we do. “But we showed today we can still stand up to people, we can still be defensively well organised. “And that’s the key to it, trying to keep building on what we’re doing.